I love coffee. The smell drifts through the air, so unique and warm and inviting it can not be mistaken for anything else. I love the sound of it dripping and gurgling while it brews with its promise of warming me from the inside out and purging all my tiredness while it breaks in through my morning. Or afternoon. And if I’m honest, sometime in the evening when I have so much work to do and I need a cup of liquid “pick-me-up” to keep me focused. However, loving coffee doesn’t necessarily mean I understand it. Or even that I know how to brew it correctly. And does understanding it mean that I have to do hours of research or buy the latest high end expensive equipment? If I want the good stuff, does that mean I am left to buy my cup of liquid addiction every day, spending all that money I don’t have in the first place? Well, Gatherhaus decided to meet up with Ellen, coffee lover and barista, to understand how I, the average person could make a beautiful, delicious and invigorating cup of coffee for a low investment. In two hours I learned how to take my average cup of coffee with my thrift store investment coffee maker, to a richer and more meaningful experience. Straight black coffee is a different beverage than a cup of coffee with cream and sugar. Both flavorful, rich, and earthy, one holds the authenticity of discovering the fullness of the bean, the other is a skill of mixology. So in effort to keep us on track, today we focus solely on brewing a perfect cup of deep, rich black coffee. Here’s what I learned for brewing the best solid everyday cup of coffee. Leave the pre-ground stuff at the store people and only invest in whole beans. Grind them right before you brew them to obtain the richest freshness. Start with a lighter roast as you experiment in finding a roaster you enjoy. A lighter roasted coffee has deep complexity, intense sweetness, fruit tanginess, and high floral aroma making experimenting more fun. 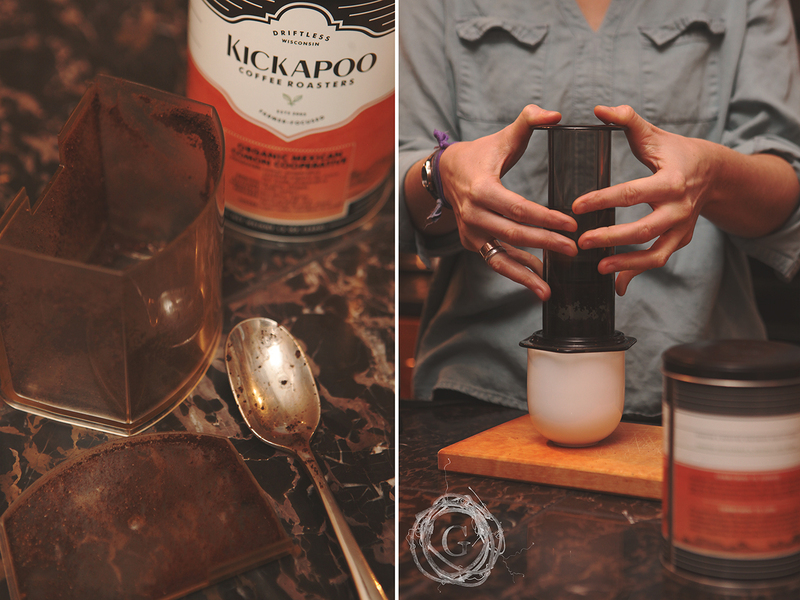 Gatherhaus recommends organic fair trade Kickapoo coffee (Kat’s favorite is the Cast Iron Blend). You won’t regret it and you can order online. Another amazing coffee to try: Old Crown Coffee. When you work with whole beans, you will need to invest in a coffee grinder. A cheap blade grinder works great to start with, and you can find one your local thrift store. The blade grinder is a multipurpose tool allowing you to use it for spices, bread crumbs and more. However, if you a have a bit of money to spend, a burr grinder is more precise, grinding the beans to the same size allowing a more consistent flavor. This is where you can take an average cup of Joe to the next level. French Press: The glass container keeps the coffee hot while it steeps for a couple of minutes rounding out the flavor. 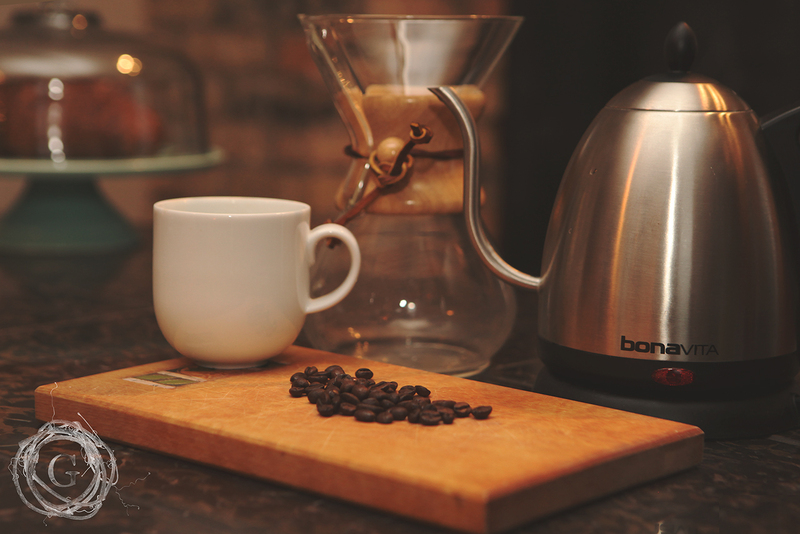 Pourover (the hardest method to control) is where you slowly stream hot water over your coffee grounds, but you must be exact in the pace of your pouring and the temperature of your water. There is a lot of room for error here, though mastering it is possible. Vacuum: This method is the most scientific, expensive, and tricky as it heats the glass vessel to extract the flavor from the beans passing it between the two pods. A regular coffee pot can get the job done, but you aren’t able to control temperature which is important. 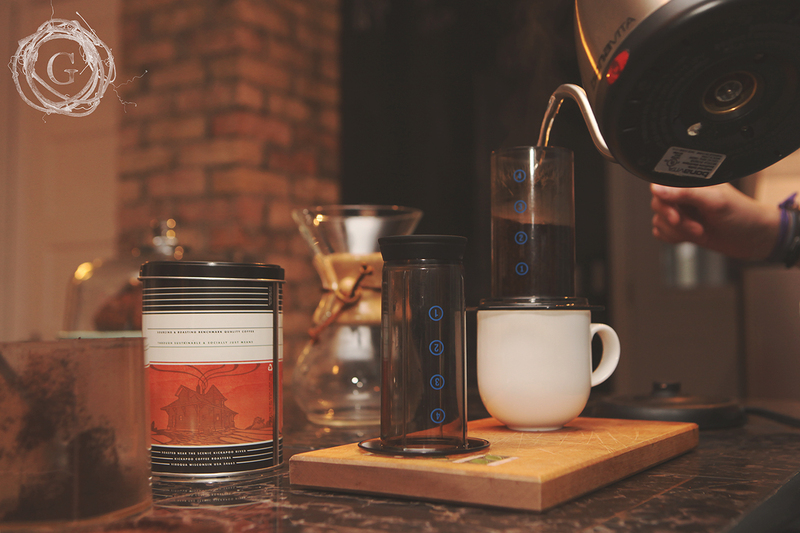 Gatherhaus really loves the Aeropress because it combines the methods and is a reasonable price. It sits in the perfect balance of art and finance. Cleaning your equipment thoroughly goes a long way to preserving the purity of your coffee flavor. Use filtered water for brewing and cleaning if your tap water has a sour taste and pre-rinse your filters to help take away the paper taste. The only thing you want to be tasting is your coffee. Water to coffee ratio is important. For all the science behind it, simply remember the most basic measurement is 2 Tablespoons of coffee to 6 oz of water. Ideally your water should be 125-205 degrees. You will end up with a perfect espresso. Add hot water and you have an Americano. After a couple practices, this method becomes an easy addition to the morning routine. And the difference? Oh my can you tell a difference! All of a sudden, my normal thrift shop pot of coffee started to taste like gas station coffee and I felt as though I should tip myself $4 after making an Aeropress coffee. It’s that heavenly. 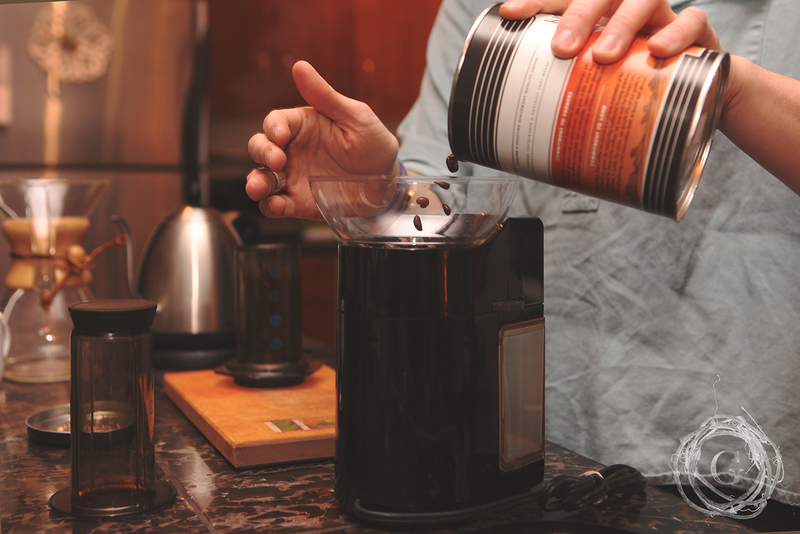 Might I suggest you put a Burr Grinder and Aeropress on your Birthday or Christmas list? I would. We received this write up from Blue Bottle Coffee that we wanted to share with you, too! Enjoy your journey of taking your coffee drinking experience to the next level. Do you have any tips on how you make a delicious cup of coffee? Share it us! We are always wanting to know more and grow a deep well of information on the things we love.